Feeling left behind, about not having the latest iPhone or iPad. Apple has brought for you its latest iOS 12. This new operating seems robust with the promises of apple to increase performance, especially for the old devices like 5s and iPad Air. 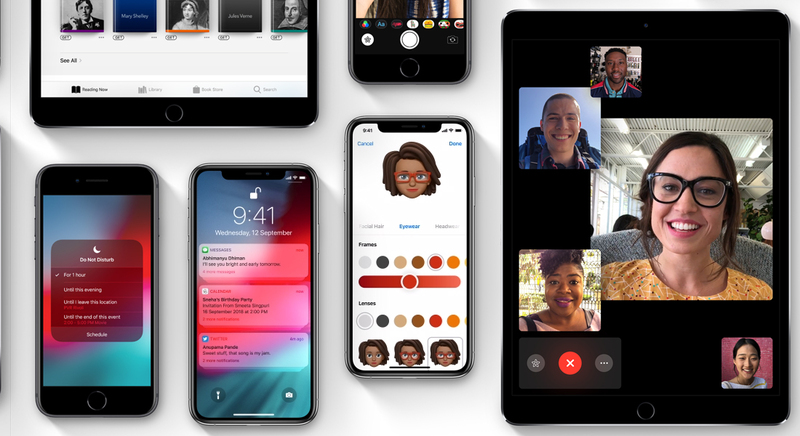 iOS 12 not only offers a speed boost to devices but various latest features are being added like new animoji, camera effects and text effects in Messages and Face time. IOS 12 will help you out in less usage of your device. That’s significantly very crucial because with the increase in the use of smartphones the people get addicted to social media apps, cat videos and games. Screen Time: New marquee feature helps you control device usage is screen time. Screen time shows the time you spend on various apps and how certainly you pick up the device along with the notifications that interrupted you. With the help of the weekly reports generated by the app, you can reduce the usage. Moreover, screen time has two crucial options, app limits and downtown. App limits let you about your use of specific categories of apps. You can also ignore the limit and can extend it up to 15 minutes, but it’s obvious, that you are harming yourself. Moreover, you can enable the downtime for the kid’s iPhone or iPad so that can play games at the time of sleep or text their friends while making dinner. Notifications Management: It’s anything but painful to end up overpowered with notifications, particularly on the off chance that you have chatty friends on chatting applications. iOS 12 can diminish the impact of nonstop notifications. On the Lock screen, iOS 12 presently shows group message threads, and multiple application on the same app. tapping on the groups can expand so that you can see the detail message. Additionally, with the feature named Instant Tuning, you can change notification settings for an application ideal from panel notification. Swipe left on panel notification and tap Manage. Instant Tuning additionally gives you a chance to send Notification Center quietly, so they don’t interfere with you yet are available later. DND feature: In the “it’s about time” dept., iOS 12 amplifies Do Not Disturb, so it works increasingly the manner in which individuals do. When you raise Control Center and force touch the Do Not Disturb button, it extends to give you a chance to turn on Do Not Disturb for 60 minutes, for whatever is left of the day, or until the point when you leave your current location. The magnificence of these new alternatives is that they cripple Do Not Disturb automatically, so you don’t need to recall—and possibly miss important notifications. Also, another Bedtime alternative in Settings > Do Not Disturb dim the display and silent the medium-term notifications until the point that you open your gadget early in the morning. Siri Shortcuts: Another new component, Siri Shortcuts, means to enable you to utilize your gadget all the more adequately. As Siri takes in your schedules, it will begin proposing alternate ways for essential activities, either on the Lock screen or when you pull down on the Home screen to look. You can see its recommendations in Settings > Siri and Search > All Shortcuts, and for those that appear to be helpful, record a custom expression that will summon the alternate way. Besides, another Shortcuts application gives you a chance to make more intricate alternate routes that can run different strides without a moment’s delay. Apple has upgraded the iPad’s application and renamed it pads. The News, Stocks, and Voice Memos applications likewise got upgrades, Stocks and Voice Memos are currently accessible on the iPad, and every one of the three has made the bounce to the Mac in Mojave, with their information matched up through iCloud. Another Measure application utilizes enlarged reality to enable you to gauge protests in reality. In Settings > Battery, iOS 12 demonstrates charts of battery utilization and action throughout the previous 24 hours or the most recent 10 days. Let’s hope that iOS 12 will prove to be a milestone for iOS app development.